This is the paradox of green tea caffeine content: the higher the quality of the tea, the more caffeine it is likely to contain, but the less caffeinated it makes you feel. Are you ready to unlock the secrets of theanine? It may come as a surprise to you, but the finest Chinese and Japanese green tea – Longjing and Gyokuro – may contain as much caffeine as black tea. Many experts claim that green tea contains less caffeine than black tea. They assume that the oxidation process increases caffeine. Green tea, being unoxidised, should contain less caffeine than black tea. Oxidation does not increase caffeine. In fact, some unpublished studies have found that it reduces caffeine slightly. So what led to the observation that "black tea has more caffeine than green tea"? Tea plant Camellia sinensis has two sub varieties: the Chinese Sinensis and the Indian Assamica. The Indian variety is a fast growing tree with large and broad leaves. It grows most of the black tea consumed in the West. The Chinese variety is a slow growing shrub with small and narrow leaves. It grows green tea consumed worldwide. The Chinese variety has less caffeine than the Indian variety. It is the plant variety, not oxidation, that causes most black tea to have more caffeine than green tea. 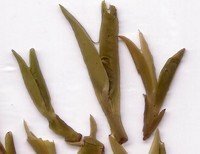 Properly speaking, green tea is a bud tea, as supposed to a leaf tea. 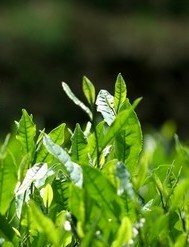 Early spring crops yield the youngest, fattest and sweetest tea shoots used exclusively for making the highest grade green tea. See the picture to the right? They are what we call "one-bud-two-leaves". The bud is in the center. It is surrounded by two slightly unfurled leaves. According to a study, the bud and first leaf contain 5% of caffeine in dry weight, second leaf 3.5%, upper stem 2.5% and lower stem 1.4%. Put another way, the younger the tea shoots, the higher the grade, the higher the green tea caffeine content. Black tea is made from mature leaves that contain less caffeine. This means that high grade green tea can have as much caffeine as black tea, and sometimes even more. If high grade has higher green tea caffeine content, does it mean we should avoid drinking it? Why? Because two very special compounds are also present in highest concentration: EGCG and theanine. EGCG bind with caffeine in hot water to render it harmless. Theanine promotes calmness and relaxed awareness. So you get the best of all worlds: theanine, EGCG and caffeine, all combined in optimum proportion. Scientific studies performed using electroencephalography discovered that theanine decaffeinates tea naturally. If about 8 times as much of theanine is given than caffeine, the effects of caffeine is completely blunted. What's the difference between a high and low grade green tea? A high grade is picked during the first few days of spring. 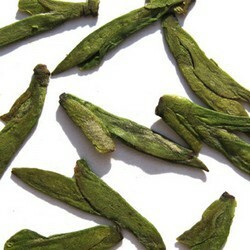 They consist of tea buds rather than matured leaves. The Chinese people discovered it hundreds of years ago. 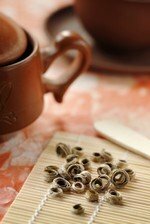 These tea buds are known to possess great healing power and are the most prized collection of tea plant. The best way to avoid green tea caffeine content side effects? Try a high grade green. Bokuchava MA, Skobeleva NI (1980). The biochemistry and technology of tea manufacture. Crit Rev Food Sci Nutr. 1980;12(4):303-70. What is the theanine amounts or content per cup? Which tea contains the highest level? What are the health benefits? Desai MY, Armstrong DW (2004). Analysis of derivatized and underivatized theanine enantiomers by high-performance liquid chromatography/atmospheric pressure ionization-masss spectrometry. Rapid Commun Mass Spectron. 2004; 18(3): 251-6.